I spent this past week in Philadelphia with 1,100 committed and talented women at the 2017 Annual Conference of the Healthcare Business Women’s Association (HBA). Inspiring & fun. These women are improving healthcare, saving lives and fully committed to supporting one another in their development. 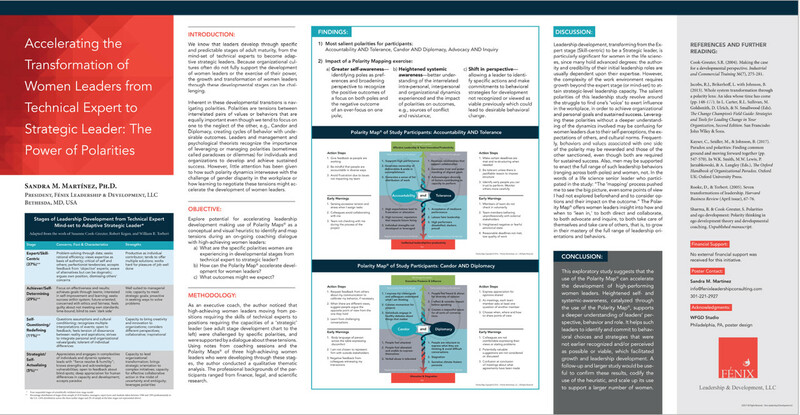 I presented the poster above about using the Polarity Mapping (R) process to accelerate the leadership development of women from Technical Expert to Strategic Leader. The Polarity Map (R) is a visual tool and process that helps leaders identify key tensions and map them to move toward concrete action steps. It seems to simplify the complexity of their experience of their interior self, their relationship with others and the dynamics of their organization so they can make sense of it. This often leads to a shift in perspective so the leader can define specific actions and make commitments to behavioral strategies for effective leadership that the leader had not previously recognized or accepted. Please comment and inquire for more information.